Cambridge is a wonderful, interesting city and university town in the county of Cambridgeshire. Cambridge University was formed in 1209 by students who fled from the hostile townspeople of Oxford. Peterhouse the oldest existing college was founded in 1284 and King’s College Chapel one of the most well known buildings was begun in 1446 by King Henry VI and completed in 1515 during the reign of King Henry VIII. The River Cam, which flows through the city, is a tributary of the River Great Ouse. The two rivers join just south of Ely at Pope’s Corner. 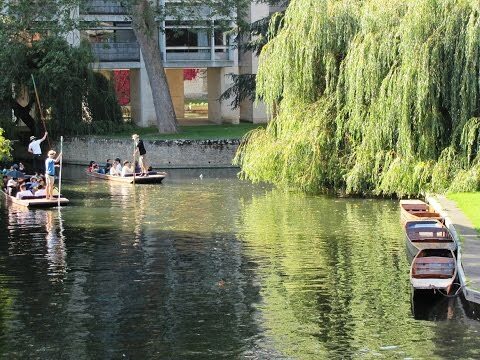 The 1.5 km section of the River Cam that flows through the city is known as the College Backs with its spacious lawns, well maintained gardens and grand, historic buildings such as King’s College Chapel, the Wren Library and the Bridge of Sighs it is one of the most beautiful stretches of river in the UK. The Upper River of the Cam is much more peaceful and relaxing as it winds its way through meadows, fenlands and woods to the beautiful village of Grantchester. On warm sunny days this part of the river is very inviting and popular with tourists and locals who want to relax and get away from it all. You can walk or cycle on the riverside paths or you can punt or row on the river. In Grantchester you can also relax, eat and take a cup of tea at the Orchard Gardens where time seems to stand still. In 1909 Rupert Brooke, the poet, moved into Orchard House, with its wooden Tea Pavilion which still stands today, and lived there until the First World War began in 1914 and then moved next door into the Old Vicarage. Grantchester is where he got his inspiration for his poems and his statue stands in the Old Vicarage grounds. The Church of St. Andrew and St. Mary which is of 14th and 15th century stands proudly at the top of the hill. Punts originated in medieval times and were used as workboats for reed cutters and fishermen on the Fens where the water was too shallow for other boats. Leisure punting became very popular in Edwardian times and it was Mr. Scudamore who really established punting on the River Cam. In 1910 he set up and founded a hire business and today his company owns the world’s largest fleet of punts. We park in a car park and walk towards the centre and the University College Houses. We wander around the centre making our way to Corn Exchange Street. At the end of Corn Exchange Street we turn right into Downing Street and keep heading forward into Pembroke Street. At the end of Pembroke Street we cross the road into Mill Lane which takes us to The Mill pub and the River Cam. We cross over the bridge in front of us and turn left along the path for a short way then when the path splits we take the right path. We head forward towards the Bella Italia and cross over a small bridge and turn left. When we reach the road we cross diagonally to the right at the pedestrian crossing and follow the cycle path through the park. At the cross roads we go almost straight over down Grantchester Street with a walking and cycling sign post “Grantchester 1 ½ miles” we now walk down Grantchester Street until we come to Grantchester Meadows. We turn right here and follow the road to the end passing a lamppost in the middle of a field called Skaters’ Meadow and then after a hundred yards we take the footpath on the left. We head forward, go through a gate into a large open meadow and bear to the left towards the River Cam. We now follow the river path on our left going through the fields, gates and over little bridges. We eventually come to a gate at the start of a wood we follow the path through the wood until we come to another gate and into a field we turn left across the field which brings us to the Orchard Tea Garden. We pass to the left side of the garden then through the car park and turn left down the road to the Old Vicarage where there is a statue of Rupert Brooke who once lived in Grantchester and was the setting for some of his poems. We now about turn and follow the road which bears round to the right and slightly uphill, to the church where we have a wander around before we walk back down the hill to the footpath opposite named Spring Lane. We head forward then turn left and go over two stiles onto the tarmac cycle path. The River Cam is about a hundred yards away on our right. We follow the cycle path back to Skaters’ Meadow and then retrace our steps back over the park to The Mill pub and the City of Cambridge. This is an easy, flat walk along the River Cam. Approx 5 to 6 miles depending on where you park. The map for this area is OS map 209. The City of Cambridge in Cambridgeshire. From the A1 take junction 14 onto the A14 then at junction 31 take the A1307 into Cambridge. In Cambridge there are toilets near Corn Exchange Street and there are many pubs, restaurants and cafes for refreshments. There is a multi-story car park in Corn Exchange Street and there are other car parks around the city. In Grantchester there are toilets and refreshments at the Orchard Tea Garden and four pubs in the village.